There is no pill for stupid! These words seem to be leaving my mouth more and more often as I deal with people who just are not bright enough to be in the jobs they are in. The biggest problem I have is with one particular sales lady at a shop I frequent on a monthly basis. She might have all the necessary educational qualifications to have her job, and she might have received all the training that the company offers. But no-one can teach her to listen. And she provides the stupidest answers to my queries, and has no sales instincts what so ever. I recently decided that it was time to change from using a 2-in-1 face powder that works as a foundation, to an actual foundation. And whereas the decision to make the change was simple, choosing the new product was not that simple. There are so many variations of foundation available and I wanted some guided information. This young sales lady told me that she would recommend a standard foundation, and then to use the face powder I am currently using over that! So much for her listening that I no longer wanted to use the product. So I left the store and went back when she was not there. I was then given a sample of a different foundation to the one she suggested, and tried that out the next day. As I liked the feel of the product on my skin, but not the packaging I went back. The second sales lady was there to help and together we worked out what would work for me. I left with a foundation in a packaging that will travel well, as well as some mineral face powder which I was told came with a brush. The sale itself was handled by the first sales lady, and she worked out that it was better for me to receive the buy 3 pay for 2 special, as opposed to the spend R350 and get R100 off. I was still busy with the second sales lady talking about night cream and did not pay attention to the sale being rung up. So, her stupidity cost me R25! Not a lot of money in the big scheme of things, but enough to frustrate me. When I got home I discovered that there was no brush with the powder. So it was back to the Mall and only the first sales lady was on duty. When I asked about the brush she told me no, it doesn’t come with one. And that was it – no offer to sell me one, or to deal with the fact I had been given the wrong information. Luckily for me, I have the brush I need at home. What I did not have at home was a book with a recipe in it for baked risotto. I had to use my instincts to create this dish, and I was really impressed with the results. By following this recipe for baked risotto you can serve this to dinner guests without having to be in the kitchen slaving away over a pan. This dish can be left alone in the oven to cook while you get on with other things. I’m excited about this recipe Tandy. I don’t have time to make it on the stove anymore and I love it. I’m very surprised when people like that choose to work in sales. How they manage to meet their sales quotas is beyond me. Sorry you were inconvenienced Tandy. I can imagine how frustrating it is! Ooh, incompetent, uninterested or uninformed sales staff drive me crazy – and they seem to be more frequently found these days. Don’t companies understand that they will sell more if they invest in decent sales people? This lovely recipe reminds me of a baked risotto recipe I have languishing somewhere. Might be time to dig it out! I have never tried a baked risotto; is it as nice and creamy as a “normal” risotto? 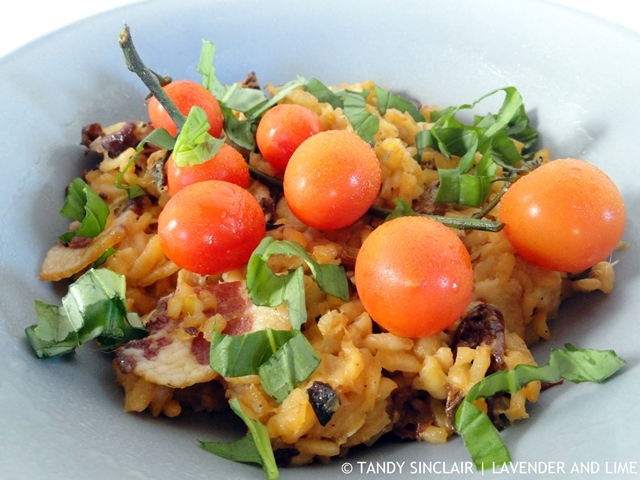 Oh, Tandy, this really looks delicious – I love risotto but usually order it while eating out. I’ve never made it at home but you’ve inspired me to give it a shot. Thanks. What a great looking dish. Making me hungry. This looks absolutely amazing. I love that this is baked as opposed to being cooked for hours upon end upon the stove top – genius! Never even thought about this baked version risotto before, tempting to try! That looks wonderful, Tandy! There’s nothing in it I don’t like, but I especially like leeks and dried mushrooms. Ah the elusive good sales service, especially in those types of stores. I do like your cooking instincts, never tried to bake risotto before, looks yummy. When anyone uses their instincts on the dish, it will always turn out wonderful. Wonderful dish Tandy. I’ve always wanted to attempt baked risotto, looks so good. You just can’t fix stupid… ! LOL However, you can make a marginal day into a fantastic day with a cozy comforting bowl of risotto. I have never baked my risotto before will have give that a try. Gah! So annoying! I love your risotto! Hi Tandy, your risotto looks amazing, love the fact that it is baked. The risotto looks amazing. I’ve never tried baking it before. Tandy, what a lovely recipe to use up the rest of my summer tomatoes which are sadly dwindling on the vine. I was looking for something special to make this weekend with the um, snow coming!! Anyhow, I agree on people not listening. Just wait until the clerk who didn’t listen that you didn’t want to use that product tries to make change. They can’t! And forget about asking anyone for directions. Sounds very frustrating Tandy! Sorry to hear about all of the troubles that you had buying something so simple! I don’t mind baked risotto especially when you’re in a hurry. Hahaha! You made me LOL! I really wish there was a pill for stupid people. It sounds like one heck of an experience to get some new makeup. Far out, I would prob find another store if that was what one had to go through. Anna, we have so few choices here it is sad!